Now that the FIA has produced its entirely predictable ruling on the Renault industrial espionage case, together with its reasons, we are able to make comparisons with the earlier handling of the McLaren case. As pointed out by GrandPrix dot com, the approach has been completely different, giving serious concern that the FIA is less than even-handed in its administration of the sport. What else are we supposed to think when everything that McLaren said was discounted by the WMSC whereas Renault statements have been accepted without question, when McLaren were sentenced on grounds of suspicion while Renault have not been penalized in spite of there being proof of what McLaren were merely suspected of, when McLaren data were loaded on to the Renault computer system yet none of Coughlan's information found its way to the McLaren system? Quite clearly, the FIA wanted to penalize McLaren severely and exceeded their authority to do so, and did not want to punish Renault, bending over backwards to excuse anything found to have been wrong in their actions. There is talk of the FIA losing credibility over the decision; but that is sheer nonsense. The FIA has had no credibility for years and has exercised blatant favoritism in its decisions without more than a murmur of discontent from the press. Although the penalties levied by the governing body have been unpredictable in the extreme, the actual decisions have been consistent to the point of utter predictability. Our actions speak far more eloquently of our motivation than do our words. And the actions of the FIA, so often at variance with its public statements, are clear indicators of an organization working to an unspoken agenda of manipulation of the sport rather than fairness in application of the rules. The plain fact is that the FIA, in deciding to go after McLaren, has gone so far beyond the bounds of reason and impartiality that an awkward precedent was set. If McLaren's penalty was justified (and it certainly was not), then at least the same must be applied to Renault, especially since Renault have been proved to have gone beyond anything that McLaren were accused of. The similarities in the matters are quite striking. In McLaren's case, two drivers were proved to have discussed some of the Ferrari info and an engineer was shown a document that he took no interest in. Nine senior Renault engineers admitted to studying some of Mackereth's documents to the extent of deciding that they were of no use. The WMSC decided that the information "must have" penetrated McLaren as a result of the drivers' discussion but accepted that Renault gained no benefit from their study of the documents. Much is also made of Renault's co-operation with the FIA and McLaren once senior management became aware of the situation; it does not seem to have been pointed out that this happened only after McLaren had run into problems thanks to its designer, Mike Coughlan. Does it occur to no-one that the real reason for Renault's sudden openness was that they realized that they too could be in deep trouble over a similar matter? McLaren were just as open when the facts about Coughlan's involvement became known but no credit was given to them as it was to Renault. Rather, it was implied that senior management at McLaren "must have" known what was going on or were incompetent for being unaware. Are we therefore to assume the same of Renault management - that they are either lying or incompetent? Predictably, the FIA also turn to the method of information transfer as an excuse. It makes a big difference, apparently, if you gain your competitor's info from a migrating employee rather than one still ensconced within the company. Yet no account is taken of the fact that a few drawings are much more useful to an engineer than some details of when a car will make its pitstop during a race. The point is really that the FIA has been forced to fudge the Renault issue because it could not afford to treat the company in the same way as it did McLaren. There are no surprises in the decision as it is exactly what we have come to expect of the governing body. When the only fair option entails the FIA admitting that it made a mistake in getting involved in the issues at all and rescinding its decision on McLaren, we can take it as read that it will take the low road and twist decisions to fit its own agenda. The only question that remains is whether this will have some effect in the future or whether we can just mark it down as one more example of the FIA doing what it wants to do to suit itself. It has become a political organization, following the whims of its leader and then giving spurious explanations when things do not work out quite as planned. Credibility? The FIA would have to care about motor sport before they could aspire to such a thing. "when McLaren data were loaded on to the Renault computer system yet none of Coughlan's information found its way to the McLaren system"
I don't understand why people try to make a point of this. Mackereth (sp?) had all his info on floppy disks so he got the IT support staff to upload it to his private home directory on the company network. IT staff aren't engineers so unless the disks were all marked "top secret mclaren stuff" had no reason to be suspicious of that. As far as I can tell from the verdict there's nothing to indicate that the data got spread over the network. Mackereth only showed paper printouts to some colleagues, much the same as Coughlan did. Therefore the fact that the files were in his home directory on the network as opposed to on a private computer doesn't make any difference. Anyway, the FIA doesn't seem very concerned about showing drawings at all, neither in this case or the McLaren one. In McLaren's case it was the continuous stream of communication between Coughlan-Stepney during the season and the De La Rosa emails implying McLaren were actively using info gained from Stepney that got the FIA to convict them (on quite shaky grounds yes). Finally, even though I feel this verdict is rather fair it's rather obvious the FIA is on witch hunt against McLaren. Latest proof being today's verdict on the 2008 McLaren car. They're obviously doing all they can to disrupt their operation. People make a fuss about the info being loaded on to the company's computer because it extends the possibility of it being used. Renault and Mackereth may claim that it all went into his home directory and that no-one else had access to it - but why should we believe them any more than McLaren were believed when they said info hadn't been used? The mere fact that drawings were shown to other engineers and examined in sufficient detail to make decisions on usability is enough to show that Renault at least contemplated using the info. McLaren were not proved to have got even as far as that. As regards the flow of info between Stepney and Coughlan, there is no proof of what the messages contained - it is speculation to talk of a "flow of info" as the FIA keeps repeating. The info that was discussed by de la Rosa and Alonso came from Coughlan but we do not know whether it arrived with him through text messages or was present in the dossier. No flow of info is proven and so it cannot be used as a justification for regarding the Renault case differently. It might be interesting to see what happens in the FIA libel case against The Sunday Times - a British court might see things somewhat differently from the WMSC. I can't believe Max is suing a Rupert Murdoch publication. He has lost all perspective. The article written by Martin Brundle has absolutely nothing in it that hasn't been said before. Favouritism to Ferrari. Manipulating the championship etc. All old hat. While I expected Renault to get off lightly as Carlos Ghosn would withdraw the team otherwise and Alonso would be left without a drive. Can't have that after he confessed all to the FIA in the McLaren case. However I find it stunning that there is no punishment whatever. Given that Renault have had the information for more than a year why has the 2007 Renault not been examined to see if it contains any McLaren ideas and why is the 2008 not being examined? Ron Dennis contacted Max when Alonso told him he would go public which is apparently the first Ron knew of it. The FIA dropped a few McLaren names at the various 'trials' but never suggested that Ron knew. Renault admitted that they had the info. Yeah! they admitted it after a Renault engineer joined McLaren and told McLaren about the info that was circulating round Renault and McLaren raised the issue. There have now been three major spying cases over the past few seasons. McLaren got hammered. Renault were guilty but unpunished and two Toyota (ex-Ferrari) engineers were found guilty by the German courts of taking Ferrari info. The FIA didn't even bother to investigate that case. No-one can argue that all three cases are so significantly different to justify the FIA's approach in each. Of course Renault have been forced to wipe the info off their server but they have not one but 28 back up copies. I think that a fair punishment would be to give McLaren copies of Renaults blueprints. Something of an eye for and eye, blueprint for a blueprint. After all if the Renault car is so radically different (as they stated it was) from the McLaren then they should not benefit from it at all while at the same time McLaren would feel Renault have not gained an advantage. After all, having someone else's design can benefit the team in more ways than just design. Theoretically a team spends big bucks to develop a new part for a car, weather it works or not. By having these documents Renault had free research, and could possibly reverse engineer a design and we would never know. Their 2008 car is perfectly legal, even if it contains McLaren innovation. Ron Dennis seems to be the only one with some sense in this sport (a statement I would not have made last year). He seems to keep quiet out of a fear that if he challenges this bogus ruling the FiA will charge him with wasting their time and disrupting the sport further (to which I would tell them to go fine themselves). The only thing that I can see different about this case as oppsed to the SG1, is that the Renault was threatening for wins where as McLaren made an amazing recovery from 2006. I guess they think that if the McLaren was so fast, and the Renault so much slower, then they must not have used their info. The FiA did do one thing for McLaren that not even Hamilton could do. They made me a fan of Silver and Black..... Nay Silver and an ugly orange. It defies belief and yet is so predictable, n'est-ce pas, Steven? They will bluster their way through, as usual, talking of side issues rather than the important points that show just how uninterested in justice they are and eventually the stink will die down and go away. Or so they hope. My only hope is that sooner or later they will over-step the mark and Max and cronies will be removed somehow. You have more or less encapsulated my own feelings about Ron Dennis, Dan. Before this season I had only taken a vague interest in him but now I've watched him carefully - and he has only risen in my estimation as a result. I'm still not a fan of McLaren's, however. They make fine cars but do not have the humanity of some of the smaller teams somehow. Another fine job of examination and review, Clive. I for one did not think that Max & the FIA would dare to not punish Renault. The facts supporting Renault's guilt certainly were clear and unequivocal. Silly me. I don't understand why there isn't a huge outburst of shock and distain over this from the fans, the team owners, the manufacturers, the EUC...and most of all, the press. I guess it just goes to show that the FIA & Max really can do whatever they want...and to hell with everyone. How very, very sad for our sport. Two things you should consider about McLaren's 2007. First most of the more intelligent journalists predicted it. 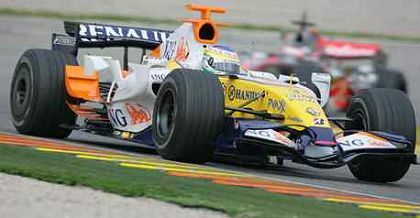 The main reason given being that the 2006 tyres clearly did not suit the McLaren whereas the 2005 no pit stop tyres did. The 2007 tyres are much more like the 2005 tyres so without making any improvement at all they would have recouped everything they lost in 2006. Secondly their peerformance before they received any Ferrari data was already exceptionally good. So it was not receiving that data that changed a bad car into a good one. I guess it takes time for us to believe that the FIA can be so blatantly biased in so many of their decisions, Don - and, by the time we have absorbed the fact, it's too late to make any form of protest. Sad for the sport indeed.